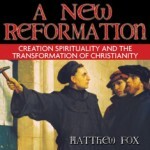 This entry was posted in Evolutionary Christianity, PONDERING PASTOR, Progressive Theology, Theology and tagged 95 Thesis, Creation Spirituality, Matthew Fox, Original Blessing, progressive christianity, progressive theology, Reformation Sunday by Rev. Dawn Hutchings. Bookmark the permalink.